Most of the United States is behind the times and the rest of the civilized world in its attitude toward declawing cats. Several major cities in California and Denver, Colorado, have banned it and are showing a growing American trend away from the practice. Pet owners who do it, use it as a solution for destructive scratching. It is a controversial topic and many organizations suggest using more humane alternatives for preventing cats from scratching you, your furniture, and your home. Declawing has been illegal in England for several years. Australia, New Zealand, Germany, Wales, Finland, and Brazil are among the many countries that consider declawing illegal or inhumane and only allow it under extreme circumstances. In the U.S., savvy cat aficionados, feline organizations, and veterinarians are mounting protests against declawing, calling it inhumane and unnecessary. The Association of Veterinarians for Animal Rights call it a practice of a cat being taken as "an emotional hostage." The inhumanity of the procedure is clearly demonstrated by the nature of cats' recovery from anesthesia following the surgery. Unlike routine recoveries, including recovery from neutering surgeries which are fairly peaceful, Declawing fits the dictionary definition of mutilation to a tee. Words such as deform, disfigure, disjoint and dismember all apply to this surgery. Partial digital amputation is so horrible that it has been employed for torture of prisoners of war, and in veterinary medicine, the clinical procedure serves as a model of severe pain for testing the efficacy of analgesic drugs. Even though analgesic drugs can be used postoperatively, they rarely are, and their effects are incomplete and transient anyway, so sooner or later the pain will emerge." It is rare to see a veterinarian cite a common medical reason for declawing, except to repair a badly done initial job in which the claws have grown back and are causing crippling pain to the cat. The closest you might come to a medical reason is to prevent the owner from having the cat euthanized because of destructive scratching. Some veterinarians will reluctantly perform this procedure for that reason. Exercise: A cat will select a surface where it can hook its claws, then pull against the resistance. This is a form of isotonic exercise, which both strengthens the muscles and provides suppleness to muscles and joints. Marking Territory: Scent glands located on the cats' feet effectively mark the area as its territory. You will notice this behavior frequently with indoor-outdoor cats that will mark trees by scratching. Anger Management: Although there is no scientific evidence for this, there tends to be an increase in scratching behavior when a cat is annoyed or upset. Declawing is not merely the trimming of the claws. It is the surgical removal of the claws which are closely adhered to the bone. 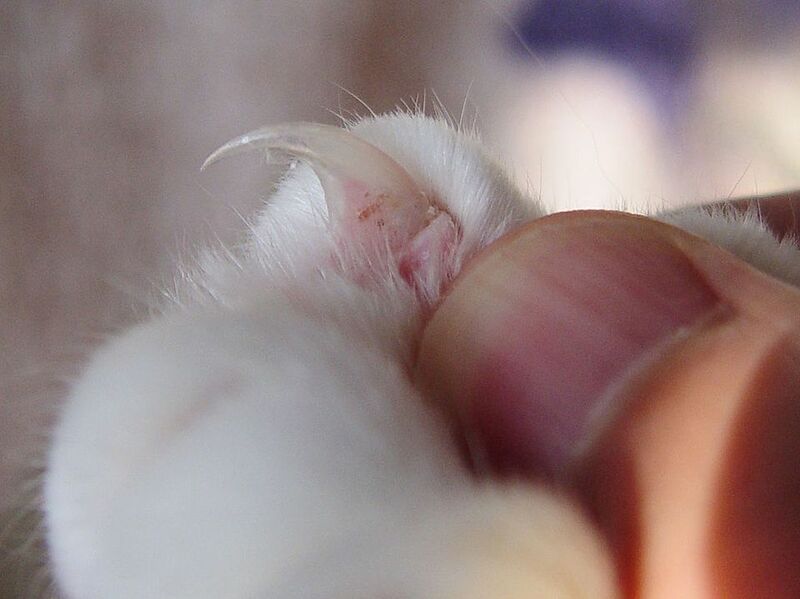 In order to remove the claw and prevent its regrowth (which sometimes results from incomplete removal), the entire first joint of each of the cat's toe is amputated. This procedure is often likened to amputation of all a human's fingers to the first knuckle. Although, it is not an apples-to-apples comparison, since cats are digitigrade, which means it walks on its "fingers and toes." Humans do not. Aside from the initial physical pain for days or weeks after surgery, other short-term effects of declawing can also lead to long-term problems, both physiological and behavioral. A declawed cat's toe stubs will be severely painful after the surgery, and phantom limb pain may be a lifelong legacy. Some litter box substrates are very painful to the cat's tender paws, and the cat may avoid the litter box entirely because of its association with pain. A declawed cat will need a softer substrate such as one of the paper-based litters. A cat's claws are its primary defense against other cats, dogs, or humans that might be harming it. Lacking claws, a cat may turn to biting, either in defense or as a warning to humans who cannot read its body language. Other cats may choose "flight" instead of "fight" and become withdrawn and depressed. Since a cat walks on its toes, pain in the toes can cause changes to its normal gait. This change in gait can eventually result in stiffness and pain in the cat's legs, hips, and spine. If you have ever experienced prolonged foot pain, while continuously walking around on your feet, then you can understand this description. Nail Trimming: Cats cannot do serious damage to furniture, drapery, and rugs with blunt nails. Trimming is pretty simple. Start doing it regularly when your cat is a kitten if you can. A cat can grow accustomed to it. If you wait until your cat is sleepy and quiet, you can take it one nail at a time over a period of several days, your cat will soon find out it's not to be feared. Simply lightly squeeze the cat's toe to extend the nail tip and snip the tip. You can buy inexpensive clippers for this purpose at any pet store. Be careful not to cut into the dark part on the underside of the tip—this is the quick which will cause bleeding. If you are hesitant about doing this yourself, ask your veterinarian to teach you. Scratching Posts: Invest in or build your own scratching posts. Sisal-covered posts are highly favored by many cats. Most cats can be easily trained to use the post for scratching instead of your furniture. You can build your own, too. Do not scrimp on the number of posts. One of the most popular surfaces is cardboard, and inexpensive cardboard scratching posts are readily available. If one post does not work, then get a second one and experiment with its location in the house. Offer your kitty a variety of surfaces and elevations, and you will soon find out its favorite spots. Soft Paws: Soft Paws were developed by a veterinarian, and are vinyl nail caps which adhere over a cat's claws. They look like press-on nails. They come in clear or colors, which can look quite fancy, and also are easy to locate if one should come off. The caps grow out with the natural growth of your cat's nails and are said to last four to six weeks, on average. Feliway: To curb destructive scratching, you might want to try Feliway. It is a cat-friendly pheromone which mimics the scent of cats' facial glands. It has been found to be useful in combating a cat's territorial urine marking and some animal behaviorists claim it works to stop territorial scratching.